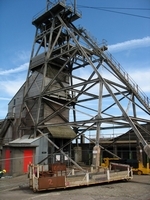 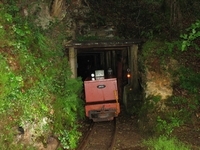 There are mines throughout the UK. 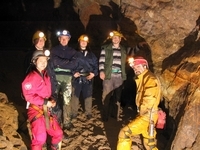 These are just a few examples visited by DCC members. 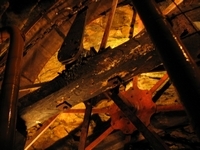 You will find more mining pictures in the . 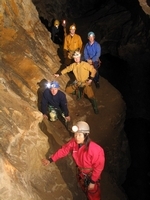 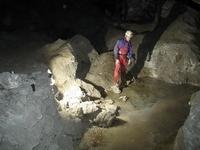 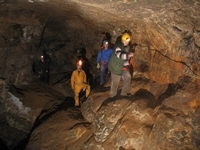 You will find more caving pictures in the Club albums. 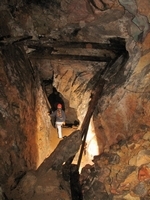 Looking up a capped and ginged shaft A winze divided into ore chute and climbing way Where's the end? 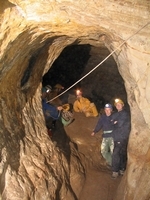 In the entrance One of the main passages with Pete, Ben and Doug The Pillar in 'the arena' Looking down a main passage. 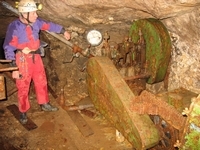 The red and white tape is presumably a safety measure. 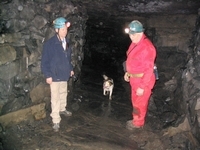 Allan and Neil waiting to descend the main 400 ft shaft by winch. 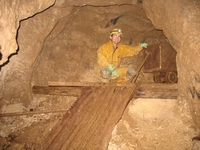 Pete looking over one of the pumps still in place in the mine from the 1950 period. 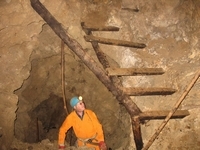 Steve looks up at a miners' improvised staircase. 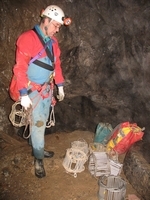 Neil poses beside a full tub of barites rich material waiting to be tipped down the chute into other tubs that were taken to the surface. 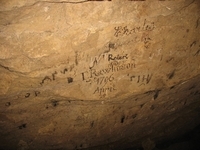 Writing on a ceiling in the Great Shack. 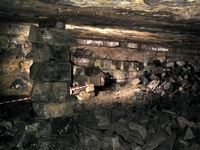 The writing dates the working to the 1790s. 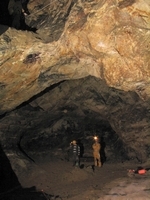 In the Great Shack where there is natural calcite deposited in the chamber. 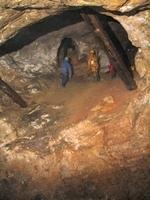 The Great Shack was a natural cave infilled with mud and galena. 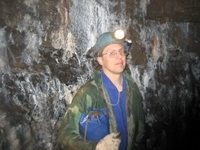 Steve poses beside an older type of metal tub in a series of workings closer to the surface. 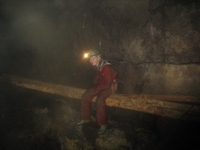 In the Forest Chamber where there are a number of timber props. 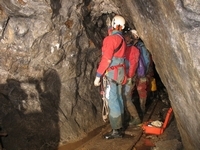 There is a pool on the floor and an active stream comes into the chamber from above. 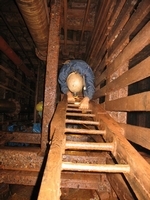 Preparing the ladders. 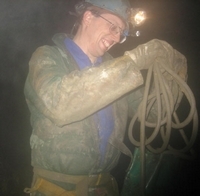 This was a retro trip but with SRT for those who had forgotten their ladder technique. 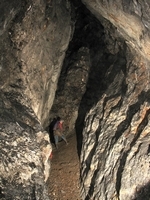 In one of the main stopes. 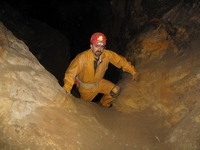 The floor is loose debris. 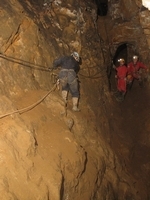 The NAMHO Chairman makes his way through a small connection between stopes. 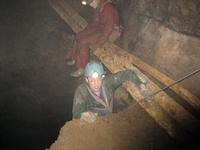 Kelvin points out features of the vein on the 40 yard level. 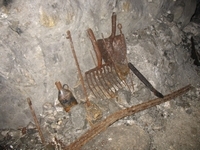 Mining tools left at a bothy on the 40 yard level. 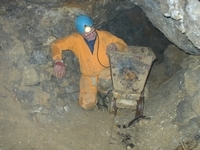 The enamelled can still contains a liquid. 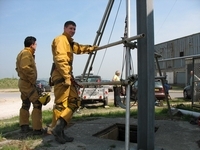 More tools. 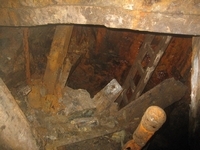 The two rods nearer to the right are copper-ended ramming rods. 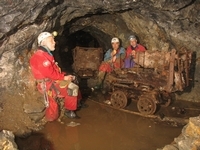 Steve, Robert and Emma have a break near two wooden tubs that are still on the rails that lead towards Black Tom's Shaft. 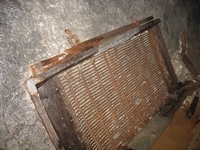 Two rare relics to find underground: the screen would normally be found on the surface, and the item on the screen is a carpenter's measuring rod to work out the length of timber to cut. 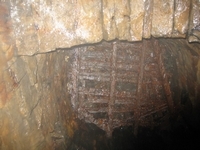 In the near surface workings east of the manhole entrance. 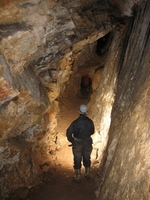 Typical of the narrower workings with the main fault wall on the right. 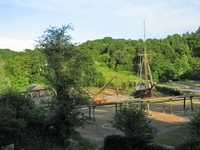 Looking north west. 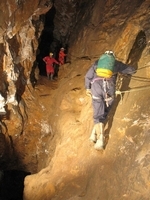 Crossing the traverse on the way in. 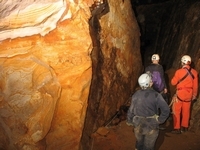 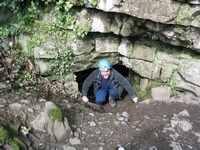 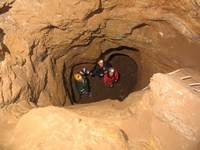 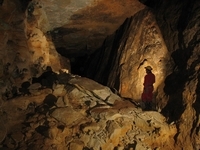 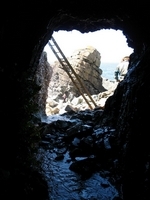 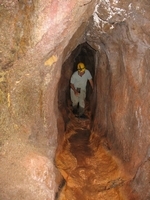 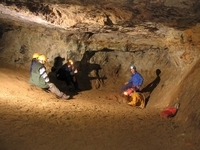 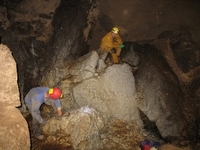 The passage drops down here to the bottom level from where ore was taken to the hauling shaft, south of the main stope. 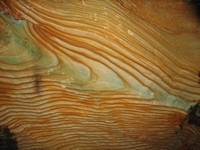 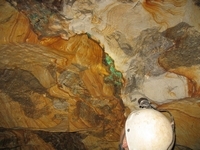 Some of the iron and copper banding in the rock on the hanging wall side of the main fault. 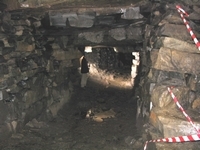 In the main passage showing an extensive area of iron banding. 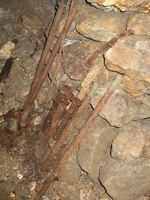 Copper and iron staining in the wall. 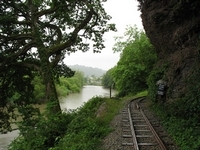 Looking north west. 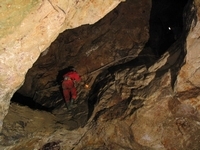 The picture show not only the main fault on the right but also the second fault on the left which makes much of the open stoping into a wedge shape. 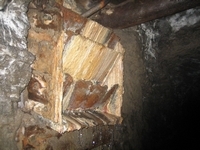 This probably helps the stability of the roof. 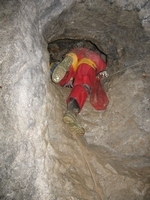 Crossing the traverse on the return route out.